Five puzzles, six books (or more), one game of Memory, word searches, and some tricycle training . . . I complain and whine with the best of them about the loss of conveniences and comfort, and I’d prefer running water with temperature control and the ability to cook meals and refrigerate food any day of the week. But a day without email and the telephone . . . well, that’s a welcome vacation sometimes. Christ Himself called His disciples away from the crowds and busyness of their lives to spend time with him alone, like unplugging from ministry life with its hectic pace and demands. “Then, because so many people were coming and going that they did not even have a chance to eat, he said to them, ‘Come with me by yourselves to a quiet place and get some rest’” (Mark 6:31). “the original word for rest in this verse is anapauo. Pauo means “to cease, give rest.” Guess what ana means? “Again!” We don’t need this kind of rest just once. We need it again and again” (p. 116). And again . . . and again . . . and again. But then the real work begins. Then we must return to the daily life in all its mundane activity and we must carry into that everyday behavior all that we learned in the holy moments we had set aside. I’m trying to see Jesus while my hands are elbow-deep in dish water and the laundry piles stack up. Can mopping the floor be spiritual? Can folding clothes be a God-moment? Can doing dishes be part of my quiet time? If we deny Him a place in the mundane day-to-day life, confining Him instead to a corner of our hearts designated “God stuff,” then we miss Him and what He’s doing in us and through us. 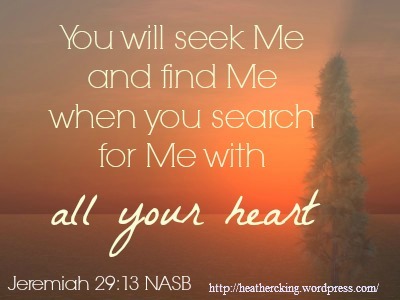 It’s what the prophet Jeremiah wrote: “You will seek me and find me when you seek me with all your heart” (Jeremiah 29:13). Not spiritual heart pieces and holy corners, but all that is in our heart searches after God. In Scripture, Naaman almost missed finding God. He was a big-shot, who commanded the army of the king of Aram, a great man, a valiant soldier, but he had leprosy (2 Kings 5:1). Hearing about Elisha the prophet, Naaman sought healing from the man of God, but Elisha didn’t even come out of his house to meet with him. Instead, Elisha sent out a messenger with some simple instructions: “Go, wash yourself seven times in the Jordan, and your flesh will be restored and you will be cleansed” (2 Kings 5:10). This was so . . . .basic. And Naaman was annoyed, angry even. Naaman wanted a magic show with special effects rather than an order to take seven baths in the Jordan. But, his servants challenged him: “My father, if the prophet had told you to do some great thing, would you not have done it? How much more, then, when he tells you, ‘Wash and be cleansed!’” (2 Kings 5:13). A few dips in the Jordan later, Naaman’s leprosy was totally healed. All because he obeyed God in something simple and unimpressive. If we have our eyes set only on the spectacular, we will miss God’s healing and cleansing work in the mundane and the everyday. Will I manage to keep this perspective over time? Probably not. I will likely grow weary and burdened with the stresses of daily busyness. I’ll need to retreat again, stepping away from it all to focus solely on God. But then I’ll come back home where dishes and laundry and homework is what happens here and in that, yes even in that dailyness and routine, I can seek God’s presence, His input, His fellowship. Heather, you are a beautiful writer. I love the heart you have expressed for more! I know exactly what you are talking about and how the little things of life can crowd would the ONE thing that truly matters. I would so love to have a place to totally unplug! But, I have to learn to on purpose take time to be alone with my Savoir and Lord! Please keep writing. I see a book in your future. Heather, I forgot to tell you who I am. I’m Barbara Prince (OBS Small Group Leader/Prayer Warrior Team). I’m excited to read more of your writings. You are so right about how all these little things can crowd out the ONE thing that is important and I love what you said about being purposeful about making room for that one-on-one Jesus-and-me time! I feel it when I fail to do that! Thanks for stopping by the blog and for the sweet encouragement—-God is so good to me! I actually have a book being published in November called Ask Me Anything, Lord. I just got the final proofs in my e-mail today and I was wowed all over again by God’s grace!! Your writing always blesses me. Keep doing it! Opening your blog posts is like a gift, and I love that you’re part of P31’s blog hop too!! May you be continually blessed as you bless others. Thanks so much! Yup, I’m hopping today! I finally had some time to sit down and enjoy reading posts from others. I’m excited! G’day Heather I LOVE what you have written and I’m excited to read more of your posts as we all journey with God through this study. My prayer every day is to have a soul that longs for more of Him as I continue to say ‘yes’ to Him. It is exciting to be joining with other women who long for more of God with this study! Thanks for stopping by the blog and sharing! Heather, I wanted to reciprocate and read your blog after you read mine – that’s what this study is all about.